Class Notes Secretary Diana Bailey Harris '64 and Doug Perednia '79 continue a conversation that began at a pre-reception discussion of the Bulletin with editor Sherri Kimmel. A multigenerational mix of about 60 alumni, parents, and prospective students greeted President Rebecca Chopp during her first visit with Swarthmoreans in Oregon. 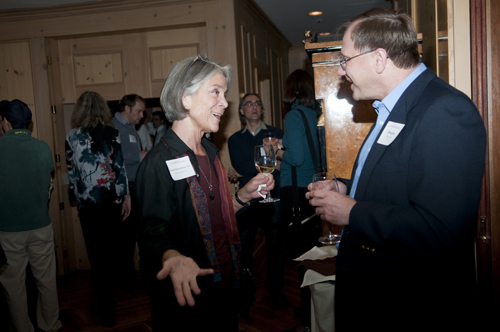 The reception at the Heathman Hotel in Portland, Ore., on April 18 enabled guests to hear from Chopp about the College’s new website, the TEDxSwarthmore event, Arts Weekend, and other highlights of the spring semester. Chopp also explained the strategic-planning process and reviewed major tenets of the plan. 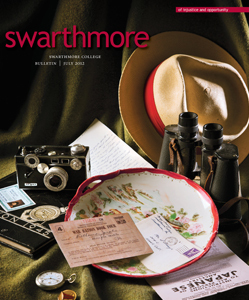 She noted that Swarthmore, as a residential college, could be a national leader in creating intentional communities. Attendees responded with several questions about the plan, the College’s wellness and sustainability efforts, access to a Swarthmore education, and Chopp’s understanding of Quaker values. On the latter topic, she invoked consensus-based decision making, deep listening and truth seeking, respect for others, and a commitment to community, social justice, and generous giving.